If you’re a regular reader of this blog, you’ll know that I’m a great fan of new research that proves the many benefits of cycling, and the latest shows that cycling improves your immune system. Wouldn’t you like to have the immune system of a 20 year old, when you’re really over 55? 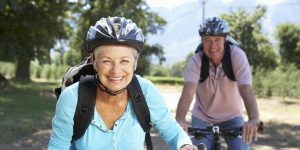 In a recent study, published in a journal called Aging Cell, researchers looked at 125 very active adult cyclists who were between ages 55 and 79. The researchers analysed their blood for markers of T-cells, which are known to help the immune system fight infections. The study authors then compared the cyclists to people in their same age group who did not exercise regularly, as well as younger adults between ages 20 and 36. Not only was T-cell activity higher in the active adults than the inactive men and women, but the cyclists were also producing the same level of T-cell activity as young adults in their 20s! Great news for cyclists. More research is needed, but the researchers write in the report that ageing is complex process that involves many factors like genetics, environment and lifestyle, and that their research suggests that physical activity—or inactivity—can be an important driver in how people age and how well their immune systems function. The researchers are planning to continue study the cyclists. “Our future studies in this cohort will aim to test immune function, notably the response to vaccination, as a clinical proof of the beneficial impact of physical activity on adaptive immune function in old age,” they conclude. The findings suggests that the gradual decline of our immune system as we age, also known as immunesenescence, might be not so inevitable. “We conclude that many features of immunesenescence may be driven by reduced physical activity with age,” the authors wrote. Of course, the study isn’t the first to show clear differences between active people and everyone else. Other research has long found that a sedentary lifestyle can increase the risk of a variety of chronic conditions like cardiovascular disease, obesity and certain cancers, especially the older you get. But this new research does further highlight the role of a robust immune system in keeping older people healthier. So that’s excellent news that cycling improves your immune system. Share your experiences via comments or the Women Who Cycle Facebook page. Next Post:Why riding my bike makes me happy?